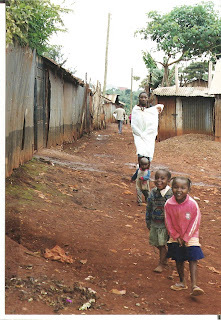 The story of Heal Ministries begins after Abby and Ericka and picks up in the Havanna slum in Nairobi, Kenya. 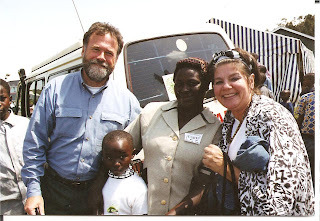 Larry Warren (pictured with me and a Kikuyu lady below posing after the church dedication day) kept stressing to me something that I finally got when seeing this abandoned mom to the left with her two little boys. The only difference between me and her: our birthplace. God gave me a glimpse of my past with my two little boys, making me aware of how blessed I am. She lives in the middle of the slum with the sewage running through her home and she has nobody to help her. In America, we are blessed with family, friends, church community and more. We are called to help those that cannot help themselves. James 1:27 is the first verse that God used to form this ministry. God views this as pure religion: to look after the orphans and widows in their distress. Sometimes we are able to help others that have similar circumstances. This is what God has called me to do with Heal Ministries: to embrace orphans and widows all over the world and to partner with other ministries, organizations and the church bringing about awareness of those we are called to serve. We can offer the hope of Jesus Christ. 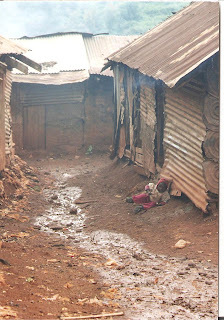 While the biggest difference between the lady pictured in the slum (with her two little boys) and me is only the place of birth: the biggest similarity between me and her is that we both need Jesus. Larry and Mary Warren are the founders of African Leadership and I am honored to call them friends and thankful for the time invested in me. They have been a huge inspiration and encourager of Heal Ministries. Please look on their website to find out about all the needs in Africa.